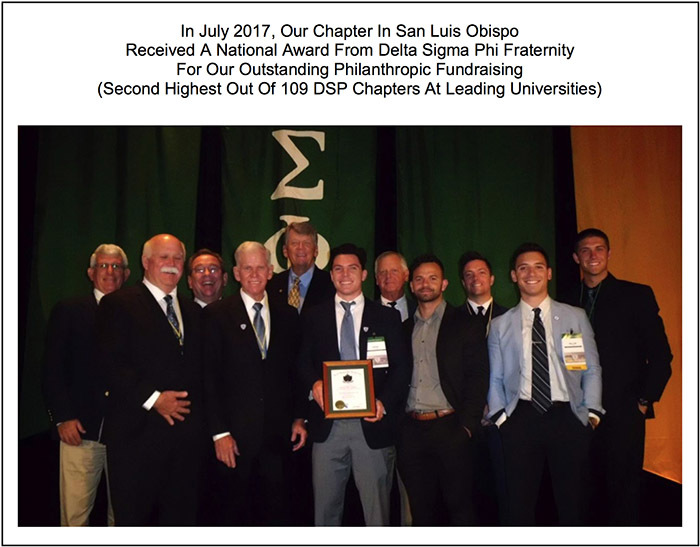 After 68-years at this University, Delta Sigma Phi Fraternity closed its chapter in SLO on April 2, 2018, for a period of 18 months, at the request of the Dean of Students. This was due to a 2014 drug-related infraction, and, in compliance with a University condition for chapter re-instatement after the 18-month period is completed. The National Fraternity, and the 1,600 chapter alumni, are committed to returning the chapter and its mission to build better men, better lives, and better communities. Our National Fraternity and alumni share the same student-development goals of the University: health, safety, academic achievement, responsible social conduct, leadership training, by-stander responsibility awareness, and involvement in and contribution to campus-and-surrounding-communities. Click here to read the DSP alumni newsletter on this subject. During early to mid 2014, a small group of members were engaged in illegal conduct associated with marijuana and this placed the chapter and the community at risk. These members were held accountable and are no longer associated with the chapter. The University removed our campus recognition in May 2015. During the three ensuing years since September 2014, our program has focused on philanthropy, community service, academic achievement, leadership training, respect for others and their views, responsible social conduct, our by-stander responsibilities to the health and safety of others, and other University goals for safe and healthy student development. Our chapter, our undergraduate members, our alumni, and our National Fraternity are 100% in agreement with University objectives for students! 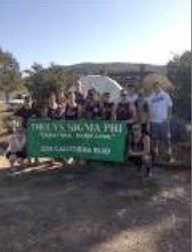 Like our fellow great fraternity and sorority chapters in San Luis Obispo, our programs help us explore and develop our leadership potential by serving as chapter officers and by serving on chapter committees. We learn to effectively work together with others of different majors, interests, personalities, cultures, ethnicities, and social-economic backgrounds. Just as in other Greek student organizations in SLO, by self-governing our chapter, and our conduct, we've learned the importance of effective risk-management! With coaching, mentoring, and monitoring by our University alumni and our National Fraternity, we have learned how to keep our members and guests safe while having a great undergraduate experience. 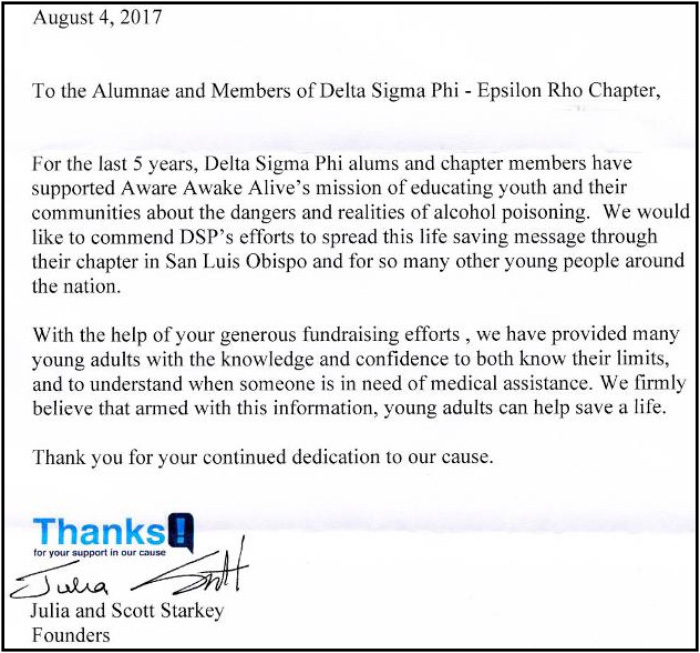 This summer the San Luis Obispo Police Department provided a letter which said our Delta Sigma Phi chapter had no tickets or violations for three years (not even for noise), and that we are a good neighbor in the community! 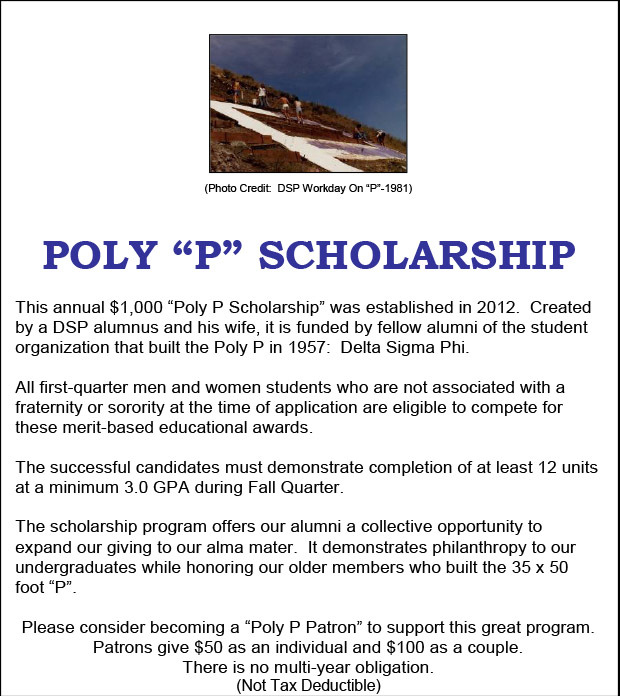 We partner with our Chapter's alumni to help judge and administer our Poly P Scholarship for non-Greek men and women students. Since its inception in 2012, we have helped to give $9,750 based on merit and need. These scholarships are a collective means for our alumni to give-back while honoring our Chapter's brothers who built the Poly P in 1957. In the 2014-2015 academic year, we converted a Chapter house bedroom to a study-room. 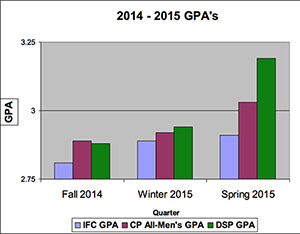 The following GPA chart was based upon University-provided records, through the end of Spring Quarter 2015, at which time the University stopped tracking our grades. Our alumni annually provide five $1,000 scholarships to our Chapter's undergraduates. They also provide the Chapter, as a whole, incentives to meet and exceed high-level GPA targets. When seniors, we are matched with high performing DSP alumni working in our field. We are given industry insights and trends, job-search-prep tips, and resume feedback. Alumni also send us summer intern opportunities available in their companies. We maintain our Chapter house and grounds as a safe-haven: they are drug-free, alcohol-free regardless of your age, and tobacco-and-smoking free - and we still have fun! 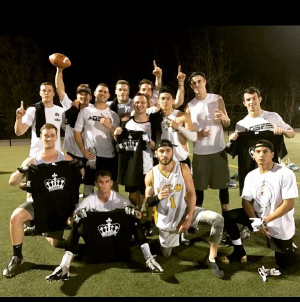 We play a lot of sports at the Chapter and around town, have socials, and live and work and eat together in a brotherhood of close friendships. Three years ago we built a sports-court. We members today had nothing to do with the inappropriate conduct of some members in 2014. We are a new group of students, working hard to live-up-to our University's goals for all students. Together with our alumni, we have put into place new Chapter rules which promote student health and safety. We have installed a values-based decision-making model that helps us do good risk-management planning. We created a Judicial Review Board to enforce both our rules and our Brotherhood Standards of conduct that every member signs. Two of these "standards" are a minimum GPA and performing at least five hours of personal community service per academic quarter. Our Chapter has served this University's students since 1950, and our National Fraternity has served other leading Universities since 1899. 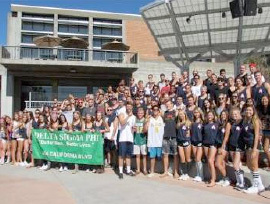 We are proud to be University students here, Greeks, and to have a 67-year DSP legacy in SLO. We are thankful for our 1,600 Chapter alumni who continue to coach and support us. We are dedicated to making our National motto a reality - "Building Better Men - Better Lives". We are hopeful that the sincerity of our purpose, and our years of living-to-vales and University guidelines, will soon result in once again being a campus-recognized student organization. Until then we wish our Greek, and non-Greek, fellow students all the very best. We ask that you understand how the Chapter lost its campus recognition and support our efforts to regain recognition. We wish to honor our Fraternity's values, principles, and ideals for member growth and community contribution, just as you honor your fraternity, sorority, club, or other student group or activity. You may read our petition for re-recognition in one of two forms: you may click on this Word document or continue reading below. 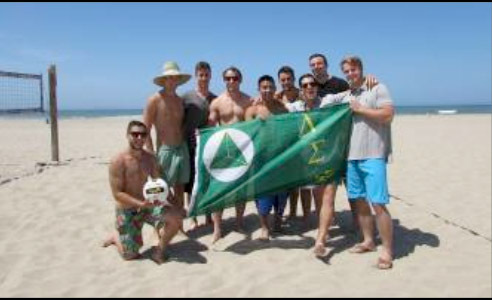 We University students, currently in the Delta Sigma Phi Fraternity Chapter located in San Luis Obispo, respectfully request the privilege and accept the responsibility of University recognition as a student organization. We current members of the Chapter had no involvement in the irresponsible conduct of 2014 that precipitated the Chapter's loss of affiliation. All members associated with such conduct have since graduated in 2014-2017, or chose to no longer associate with our organization and our strict conduct requirements. We promote and apply the University's values and goals, and following the incidents in 2014, we completely overhauled our Chapter's system of internal self-management processes. Our University alumni have significantly expanded their external oversight and guidance systems. In combination, these systems teach student responsibility and accountability, promote risk-management, protect student health and well-being, and enhance student success. We are, in short, a completely new fraternity culture, and believe we have shown, through the corrective measures detailed below, our sincere efforts to contribute to the University's communities. our National Fraternity and University alumni thoughtfully considered multiple options and chose not to close the Chapter after the September 2015 University appeal decision was announced. Closing would have left serious risk elements in-place within the University and student communities. Maintaining an open Chapter, with continued highly-restricted operations and extraordinary levels of alumni and National Fraternity engagement, provided the teaching platform needed to achieve the University's goal of removing risk to students. The inappropriate student culture present at the Chapter in 2014 has been replaced with one which stresses individual accountability and by-stander responsibility to others. We respectfully seek the University's encouragement and recognition for what we have accomplished. We have learned, discussed, applied, and promoted the University's goals for socially responsible student conduct, community involvement, academic achievement, and meet or exceed the standards of current on-campus student organizations. 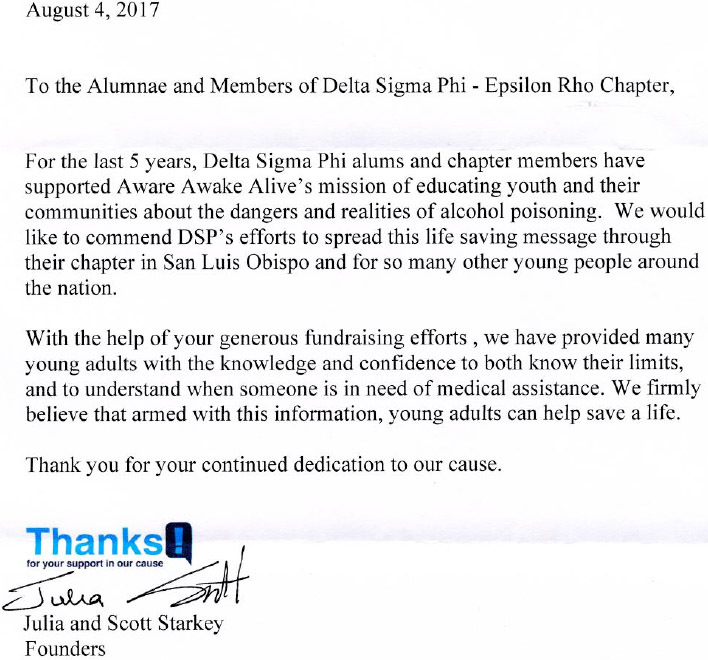 For these reasons, we respectfully ask for official University recognition of Delta Sigma Phi as a Cal Poly student organization. For a few weeks following the August 10, 2014 robbery attempt at the Chapter house, we used the word "victim" to describe our situation. •	Failure of alumni to raise their hands, fill offices or travel to mentor, and make more chapter visits by mentors with authority to act – which may also have averted our current situation. We are victims – but victims of not educating our men to their greater responsibilities – those to 1600 alumni, to our Cal Poly legacy, to our reputation, to guaranteeing a future chapter for the next 1600 men to experience the richness and learning that brotherhood brings with it. WE CAUSED THIS AND WE MUST FIX IT! This is also part of the story – and I ask you to please consider these thoughts in your communications to alumni. The more that “it wasn’t our fault” is said, the less likely it is for teaching to be successful, and for change to occur. During Fall Quarter 2014, ACB met with Exec twice at the Chapter. The second meeting was Homecoming. ACB President Bob Veazie made a third visit, a solo surprise visit for a weekend to observe the chapter and reinforce member commitment to the plan. National Director of Risk Management Cameron Warner and National Chapter Development Coordinator Bryan Witt also visited the Chapter during Fall Quarter 2014. On November 8 they led our men in a mandatory six-hour member-training. ACB arranged for this training to take place at Madonna Inn’s Garden Room and paid the $4,000 in associated meeting-room and meal costs. •	was responsive, timely, and respectful in University-requested meetings with the University's Vice-President and with Deans. We appreciate that the University recognizes that rehabilitation is essential to restoring a student's, or organization's, standing and ability to again succeed in their mission and contribute to the larger community. Better Decisions Group: Students need to meet with a counselor for a referral to the group. There is a one quarter commitment to attend the group. We feel intervention, education, mentoring, and rehabilitation is as appropriate to a group of students as it is to an individual student. At Cal Poly, the most important person on campus is the student. We start with the premise that all of our students, because they have met Cal Poly's high standards for admission, are equipped to succeed. And then our dedicated faculty and staff bring to bear their enormous talent and unwavering commitment to students' success. Central to this process is Cal Poly's distinctive Learn by Doing approach, in which we provide students with daily opportunities to apply classroom theory to real-world problems in the context of a comprehensive polytechnic education, grounded in the arts and sciences. Learn by Doing enables students to develop deep confidence in their knowledge and technical skills, preparing them to become resourceful and innovative professionals who can help solve the problems of an increasingly complex and technological world. Highly motivated students, talented faculty, dedicated staff, and the dynamic nature of Learn by Doing - these are important facets of Cal Poly, but not the whole sum. An exceptional university succeeds only if it has the full engagement of the entire university community - students, faculty and staff, parents, alumni and friends - one that joins together in a partnership of discovery. Fortunately, Cal Poly has an abundance of people deeply committed to a vibrant partnership, and deeply committed to transforming lives, one student at a time. It is my great privilege to be associated with the people of Cal Poly, and I invite you to join our partnership. Cal Poly will be the nation's premier comprehensive polytechnic university, an innovative institution that develops and inspires whole-system thinkers to serve California and to help solve global challenges. Cal Poly fosters teaching, scholarship, and service in a Learn by Doing environment in which students, staff, and faculty are partners in discovery. As a polytechnic university, Cal Poly promotes the application of theory to practice. As a comprehensive institution, Cal Poly provides a balanced education in the arts, sciences, and technology, while encouraging cross-disciplinary and co-curricular experiences. As an academic community, Cal Poly values free inquiry, cultural and intellectual diversity, mutual respect, civic engagement, and social and environmental responsibility. 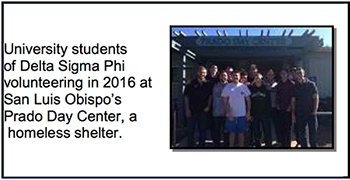 University students of Delta Sigma Phi volunteering in 2016 at San Luis Obispo’s Prado Day Center, a homeless shelter. 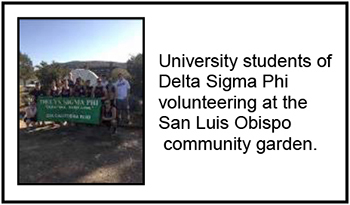 University students of Delta Sigma Phi volunteering at the San Luis Obispo community garden in 2015.
over a three-month period in Spring 2015, we held weekly meetings to develop a strategic, multi-year, plan of self-improvement. We created by-laws, rules, and standards of conduct. one of these structural change in Chapter self-management and operations was that every member was required to sign an agreement to abide by, and be held accountable to, the By-Laws and conduct Standards. The source document is forty-eight pages long. The following are relevant excerpts that deal with member responsibilities. "I believe that this plan will improve all aspects of our chapter from academics, attendance, safety, financial success, and philanthropic success for the next 5 years. I also believe it will aid the massive culture change that started in 2012." This vision is to create a framework, based in our values, for the future brothers of our chapter to follow. b. Make sure every member and new member understands the necessary steps to insure the health and safety of all members, students, and community members"
"The New Member Education Process is to incorporate the new members into the values and new culture of Delta Sigma Phi. This process is designed with the intent to turn young men into mature and educated brothers of Epsilon Rho." "Academics has &am; (sic) always will be an important component of this fraternity, and it is of utmost importance that we continue to foster an academic environment throughout the house." 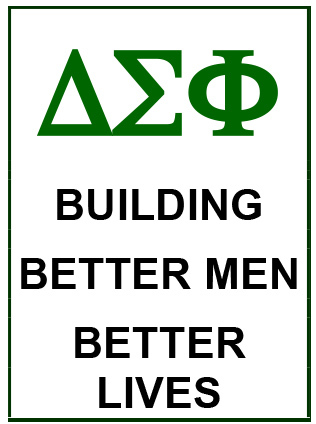 "The brothers of the Delta Sigma Phi Fraternity, in accordance with the by-laws of the Epsilon Rho Chapter and the five cardinal values of the Fraternity: Pride, Loyalty, Professionalism, Leadership, and Tradition have developed this risk management plan to make perfectly clear the standards that the brothers are held to in the fields of risk management, alcohol awareness and safety, and sexual assault awareness and prevention. The below listed manual must be absolutely followed in order to ensure the safest and most responsible social environment for not only the brothers of the Fraternity, but for the bystanders and guests of the Fraternity as well." "Education about the effects of alcohol is absolutely integral to the safe functioning of a Delta Sigma Phi sponsored social event. Anyone under the age of 21 is STRICTLY FORBIDDEN from possessing, consuming, or being under the influence of any amount of alcohol at all times during all social and brotherhood events. Members and guests are forbidden from possessing, consuming, or being under the influence of any illegal mind-altering substances. Nobody of any age is to possess alcohol at the chapter house..."
"Sexual harassment of any shape or form has absolutely no place within the Fraternity and a zero-tolerance policy is strictly followed when accusations of sexual harassment are brought to the attention of the judicial board. Therefore, not adhering to our principles and fulfilling the obligation of our shared morals will result in expulsion from the Delta Sigma Phi Fraternity if found guilty by the appointed judicial board. Any member who witnesses a sexual assault must immediately report the incident to both the President and Sergeant-At-Arms." "Both the chapter President and the Sergeant-at-arms are charged with the responsibility of ensuring that the chapter respects and operates under the said rules. Any failure by the house to abide by the said policies directly reflects upon their (President and Sgt. @ Arms) ability to keep their position within the house." We created an independent judicial review board to enforce by-laws and rules, with authority to fine, put on social probation, or recommend for expulsion, members of the Chapter, including Executive Board officers. The Chapter President and Sergeant-At-Arms may also be removed from officer for inadequate performance of their duties. "In order to implement all of the positive changes laid out in this plan a strong judicial board is needed to enforce the new Brotherhood Standards. This Board will act as a secondary branch of our Fraternity’s inner government in order to hold a separation of powers. (The) judicial board is to issue fines and punishments for brothers who have not abided to the by-laws or who have not lived up to the standard set by the brotherhood as a whole." 5. Must pay all house bills"
over a three-month period in Spring 2015, we held weekly meetings to develop a strategic, multi-year, plan of self-improvement. We created by-laws, rules, standards of conduct, and an independent judicial review board to enforce by-laws and rules. This structural change in Chapter self-management and operations was a result of the past Chapter President's unlawful activities in 2014. Every member subsequently signed an agreement to abide by, and be held accountable to, the By-Laws and Brotherhood Standards. The source document is forty-eight pages long. The following are relevant excerpts from this document that deal with various member responsibilities - and a new system of independent enforcement. "This vision is to create a framework, based in our values, for the future brothers of our chapter to follow." "Academics has & (sic) always will be an important component of this fraternity, and it is of utmost importance that we continue to foster an academic environment throughout the house." "In order to implement all of the positive changes laid out in this plan a strong judicial board is needed to enforce the new Brotherhood Standards. This Board will act as a secondary branch of our Fraternity’s inner government in order to hold a separation of powers. (The) judicial board is to issue fines and punishments for brothers who have not abided to the by-laws or who have not lived up to the standard set by the brotherhood as a whole"
One of the strongest improvements in member empowerment that our alumni provided us is Issue Escalation"". This process provides all members, guests, neighbors, visiting alumni, parents, or University or community representatives with the names and contact information for three Alumni Corporation Board officers. 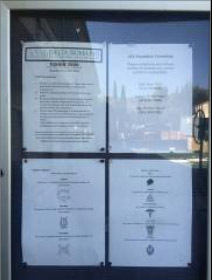 This information is permanently posted in a highly visible location on an outside wall of the Chapter house to enable the escalation of concerns to governing alumni. We undergraduates annually choose these three alumni." To date this program has been utilized a few times by membership for relatively minor issues, with one exception. In the 2014-2015 academic year, a despondent member's planned suicide attempt was avoided, campus counselors and parents were immediately involved, and the student received needed psychological care in a specialized medical facility near his family. Lead Chapter Advisor: During the school year of 2013-2014, and for several years prior to this, we had no Lead Chapter Advisor. 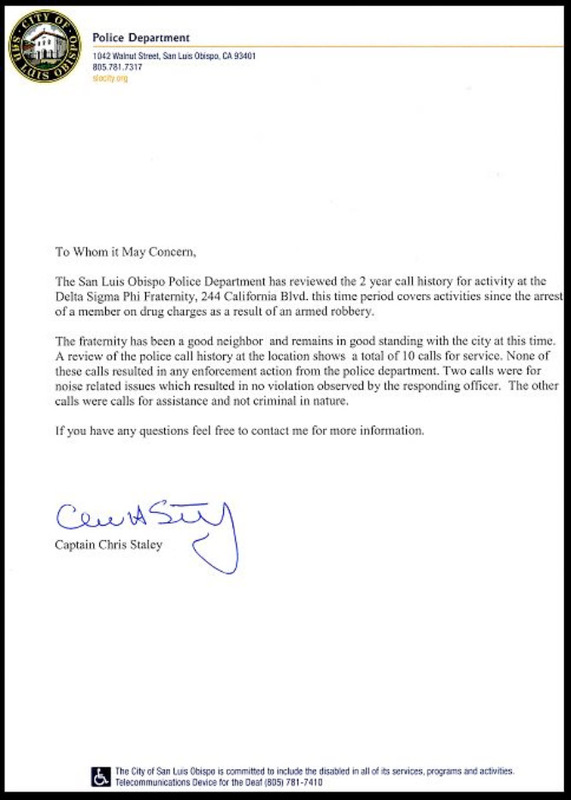 No other ACB officer lived in San Luis Obispo. Our membership had no local alumnus in governance to directly speak with about issues. We feel this vacancy significantly reduced communications, understanding, and risk management. our alumni filled this position as a priority in April 2015 with a highly experienced alumnus living in San Luis Obispo who now maintains regular contact with us and frequently visits us at the Chapter. His name is Bill Bradley, he is a retired Naval Commander, a past Chapter Supervisor during the 1970's and 1980's, a successful businessman, and we appreciate him. His motto is, "think if this is good for the men and for the chapter". ACB Secretary: The filled ACB Secretary position was staffed with an alumnus who was usually absent due to moving out-of-area and starting his family. This position was refilled with an outstanding, young, leadership-award-winning alum who attends meetings and contributes to bridging-the-gap between our older alumni officers and our Chapter's Executive Board. His name is Eric Winkler and he is a past Chapter President and Eagle Scout. He led the effort in 2015-2016 to re-write our Chapter rules and by-laws and conduct standards. 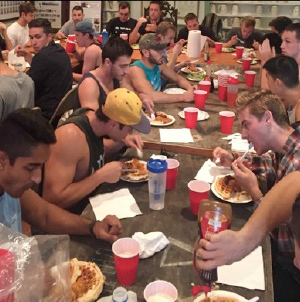 our alumni embraced National Fraternity programming to bring greater resources to our Chapter. A new, additional, Chapter engagement and oversight body in the form of "Collegiate Chapter Advisory Board" (CCAB) was added in 2015-2016. It supplements the ACB which has legal ownership of the Chapter property and governs the fraternal program. Three of the four "Advisor" positions have been filled, and we continue to search for a qualified alumnus to fill the last Advisor position. Per our conversation I have attached the dual model approach (CCAB and ACB) currently being implemented at 35 chapters. I am happy that Epsilon Rho will be the next chapter to incorporate this model into your volunteer structure. If you have any questions whatsoever, please do not hesitate to drop me a line. The purpose of the Collegiate Chapter Advisory Board is to serve as the primary level of hands-on volunteer support for a chapter. Members of the CCAB serve as advisors for the day-to-day operations of chapters, guiding students to lead and advance the chapter for longevity and growth. •	The ACB President may vote in place of the Chapter Advisor at Convention. The CCAB & ACB dual model encompasses two volunteer boards supporting a single chapter. 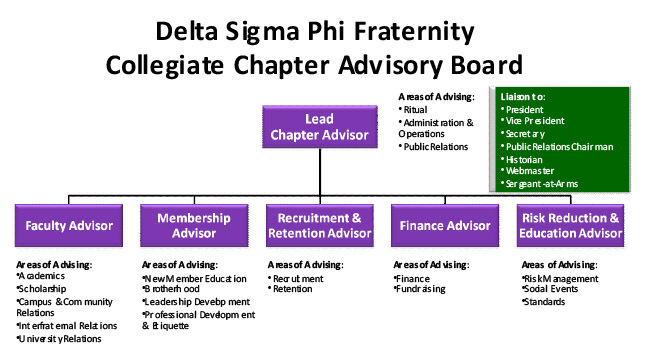 Unlike the former ACB model, the advising board has been separated into a separate body. While neither of the boards is a part of the other, it is the expectation that each of the boards communicate with one another. As we continue to develop the dual board model, we envision the Chapter Advisor & ACB President to communicate frequently amongst themselves as well as the Chapter President. The present incumbents of the Chapter's two most influential ACB officer positions were sent to the National Fraternity's bi-annual Convention in July 2015 in New Orleans, Louisiana for multi-day training. These trainings include workshops on various areas related to effective risk management and member education. In July 2017, a total of eleven Chapter alumni attended the bi-annual National Fraternity Convention' and training in Baltimore, Maryland. These included past and present ACB officers, current Collegiate Chapter Advisory Board Advisors (CCAB), and Alumni Association members engaged in supporting our Chapter. Two were unavailable at the time of this photo. Beginning in the 2015-2016 academic year, our alumni changed the date of our annual Fall Quarter meeting with them. This meeting is at the Chapter and reviews "Goals And Objectives" (G&O's) for the year. Starting Fall Quarter, 2015, ACB advanced the annual "G&O" meeting date from Homecoming (October or November) to the start of term and classes. This period is notoriously risky due to an influx of approximately 4,000 energized freshman who are often living away-from-home for the first time. They invade surrounding off-campus neighborhoods, including ours! In 2015, ACB spent $18,000 on fencing and gates - to keep the crazy freshmen, partiers, alcohol and drugs, and trouble out. Our Chapter house and property are strictly alcohol and drug free. Beginning in September 2016, alumni expanded their start-of-term ACB meeting with us from one to four days. They introduced and conducted an ACB review of every member. Teams of two to three mostly older alumni met with each of us for twenty-to-thirty minutes off-property to allow for confidentiality and prevent interruptions. We found these meetings to be mutually useful and constructive. Based upon the success of these interviews, our alumni have told us this will be a recurring element every September. Prior to September 4, 2014, our Chapter was represented at twice-a-year ACB meetings by only our Chapter President and Chapter Treasurer. Those are the only two voting members of ACB from our Chapter. Often the Chapter's Housing Chair would attend, usually to discuss renovation or repair needs with the property owner - our alumni. Yes - he always asked for money! In the past, the Chapter's Executive Board, and membership, received filtered ACB guidance indirectly, and lacked the ability to reach-out to ACB in person with any concerns. Beginning in Fall Quarter 2014, all Chapter members were, and continue to be, strongly encouraged to attend all ACB meetings in San Luis Obispo and be engaged. These meetings have been well attended. our alumni, who own and rent our Chapter house and property to us, paid $4,000 in attorney fees to develop a non-standard, California, tenant lease agreement for room rental. The agreement received guidance from the University's on-campus dorm room lease provisions. First used in June 2016, and continuously since, the lease forbids possession or use of non-prescription drugs based on the Federal definition, and forbids medical marijuana even if prescribed. It forbids possession or use of alcohol, regardless of age. The lease requires those of us living at the Chapter, or visiting the Chapter house and property, and guests, to follow a defined set of conduct standards. 3. 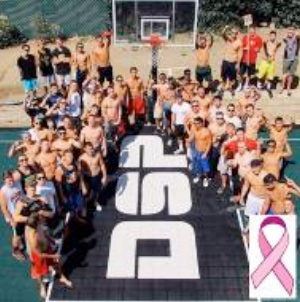 "As such, Delta Sigma Phi complies with all campus regulations, including the ZERO tolerance policy for drugs, (other than prescription medication), including marijuana, on the premises. 4. There is a strict no smoking policy in or about the premises. This includes the smoking of cigarettes, marijuana and other smokeable substances with and without prior permission to ingest. Household members must smoke only in the off property designated spaces. 5. Pursuant to National Chapter regulations, the premises is a “Dry House.” This means that alcoholic beverages are not allowed on the property at any time. 6	Do not use or possess illegal drugs in, about or upon the premises or property. Use of “medical marijuana” is prohibited on the property as Landlord is subject to Federal rules and regulations." our backyard is being converted to a multi-purpose sports court. The slab will be covered with a special synthetic grass-like carpet. 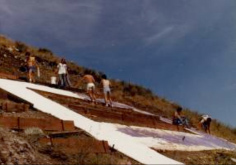 Special thanks to the six men of Fall 1975 for contributing a major portion of the cost of this project, and to F’75 Rick Rengel for providing expert project management. The Chapter and ACB are paying for the balance of the project’s cost. Rick Rengel said, "Of course, why wouldn’t Fall ’75, the best pledge class Epsilon Rho has ever seen, not want to give back for all the wonderful times and memories? We hope the brotherhood will grow stronger with a place to play basketball and volleyball, a little friendly competition between the brothers of studies and work." Two months following the September 2014 incident, our membership converted the arrested member's empty bedroom at the Chapter house into a study room. As a result of this action, and our creating a new officer position of "House Scholar", and a Chapter Executive Board that emphasized achieving academic success, the Chapter's GPA soared by Spring Quarter, 2015. The following 2014-2015 academic-year GPA chart is based upon University-provided GPA information. We are unable to provide subsequent GPA attainment as the University does not track these records for campus-unaffiliated groups. Key Exec Officers from the outgoing and incoming Board held a leadership retreat in 2014. They filed the follow report for the alumni newsletter. To further promote academic success by those at the Chapter, alumni and the Chapter's student-members shared the approximately $10,000 cost to install an advanced internet network at the Chapter house during the 2015-2016 school year. over the past three academic years, our alumni annually invested $40,000, for a total of $120,000, in support of our education, leadership training, and character development. ➢	Chapter Officers are annually compensated a total of $14,040 for their services. ➢	Commissary Steward and members who cook are compensated $5,400 a year. ➢	Members who live at the chapter house pay 25% lower rent than market. ➢	Alumni give five to seven $1,000 scholarships a year to reward and incent character, service, work ethic, and leadership. This adds up to $25,000 to $27,000 in direct annual compensation, and $14,500 in rent reductions using the more conservative estimate of 25% in housing savings. This averages about $40,000 in annual fraternal support for the academic mission of our members. This program encourages work ethic, promotes leadership development, provides a less expensive housing option to those in need, and rewards character and service. This week our executive board at Epsilon Rho has worked hard on formulating, expanding, and finalizing four important chapter documents. After meeting with Tyler last week he suggested that we get these documents completed and turned into all of you by today. These documents include a code of conduct summary based on our bylaws - below. Let us know if there are any attributes about this documents that need to be expanded upon or changed. By signing this document I agree to adhere to the above standards and if I do not I understand the consequences I face which could lead to my disaffiliation from Delta Sigma Phi Epsilon Rho chapter. The purpose of the Regional Leadership Academy (RLA) is to provide a holistic educational experience centered on the development of strong character and critical thinking skills. The program has three components and is excellent for existing student-leaders, emerging leaders, and those who seek to explore if a future leadership role is appropriate for them. The purpose of this program is to increase members’ confidence in communicating with each other, as well as the outside world. Participants use critical thinking skills to adapt their communication style to varying audiences and circumstances. The purpose of this program is to introduce participants to the concept of Challenging the Process. Members will be taught to recognize the need to think critically when planning an event or making a decision. They will be able to identify unethical situations and recommend alternative solutions. Participants will gain confidence in challenging their peers. The purpose of this program is to equip our members with the tools to build a successful future for themselves. During the course of this program participants will think critically about their future plans and set specific, measurable, attainable, relevant, and timely goals for themselves. Participating members will practice networking and identify what qualities that they wish to seek in a mentor. In order to follow the guidelines set out from National I was wondering if you could help us with two important National Training Events. We need to send brothers to RLAs and have them apply to the Leadership Institute. 1. Could you find out the dates and locations of RLAs closest to SLO? This way we can plan ahead of time who will attend this event. 2. Could you find out the dates and locations of LI closest to SLO? As well as the application for sending members to this training event. Presidents’ Academy is a three-day training initiative for incoming undergraduate Chapter Presidents. Here, these important chapter officers learn and share best practices in management and leadership through self-assessments, keynote presentations, and individual coaching to help each President learn more about his specific strengths and abilities. 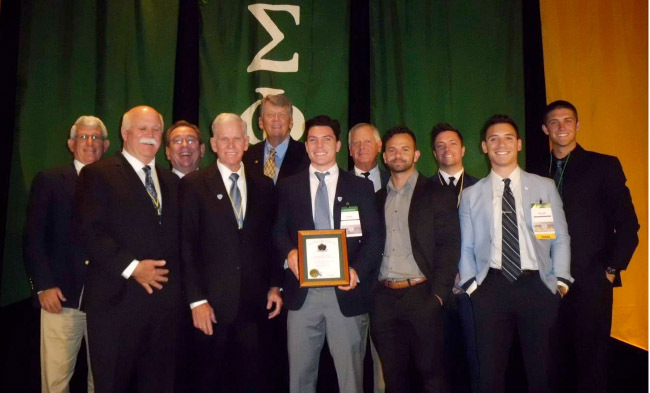 Program curriculum also includes Delta Sigma Phi policy and operations, with Chapter Presidents learning how to organize and implement ideas, enable and inspire others, and share best practices for chapter success. RUN FOR OFFICE IN CAMPUS GOVERNMENT AND CLUBS! Your University alumni reach-out to you to encourage your participation in student government and club leadership. This experience has helped many of us develop our leadership skills, presentation ability, and networking system - so why not you? A recent Delta Sig grad wrote the following newsletter article. This year Epsilon Rho has six members serving in the University's student government! In a school-wide election, three brothers received the most student votes from their respective Colleges and will represent that College on the Associated Student, Inc. (ASI) Board of Directors. Three other brothers were appointed to the University Union Advisory Board (UUAB). There are 6 Colleges at the university and only one student representative is appointed per College to serve in the UUAB. 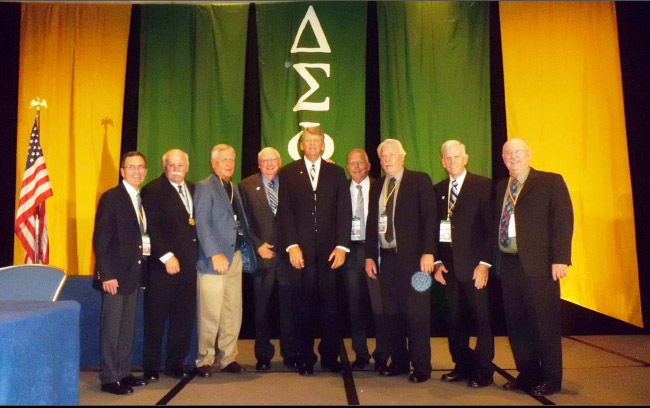 The following Delta Sigs serve on the ASI Board of Directors. Representing the College of Architecture and Environmental Design is brother Daniel Marver, F’2008. Representing the Orfalea College of Business are brothers Oliver Liu, F’2009, and Kevin Capata, F’2008. Representing the College of Agriculture is brother Evan Vandenberg, F’2008. Representing the College of Architecture and Environmental Design is brother Bodie Bloyd, F’2008. Representing the Orfalea College of Business, and Vice-Chair of the Board, is brother Solomon Reda, F’2007. It is our hope that we six upper classmen (all juniors or seniors) are paving the way, and motivating, younger brothers to get involved! When University President Dr. Jeffrey Armstrong dined at the chapter as part of our Engineered Leadership program of guest speakers, he was pleased to see so many members of student government and the IFC President – all Delta Sigs! At our request in 2016, our alumni began designing a mentoring program to assist with job-search preparation. This is alumnus Chris Patterson announcing the launch of a test-program to provide our 29 graduating seniors with industry insights by alumni - to assist you in preparing for interviews and job search! To the degree possible, we will match undergrads with alumni working in the student's field of study. Please consider this an introduction. Alumnus Solomon "Ruby" Reda, please meet graduating seniors Sean "Reptar" Donnelly, Nate "Fobo" Marks, and Andrew "Krusty" Seaman. Brother Ruby graduated in IT and works at Apple. On his own initiative, while an undergrad brother, he created the Alumni Relations function, and served in this role. Subsequent to his graduation, the Chapter elevated this function to an Exec Officer position with full voting rights. You could not be in better hands. At last Spring's ACB meeting, Chapter President-elect ORC asked alumni to assist our Chapter's program due to lost program elements. ORC asked if we could assist our graduating seniors with "how to get from here (college) to where you (alumni) are (employed)"! ORC said this would also be a major help in recruiting the better men during the Chapter's period of campus-disaffiliation - with the many resulting recruitment and operating restrictions. This is a test-program without a prior program-model to guide us. Let's start with the following guidelines and adjust going forward as needed. •	I will be the program facilitator. I am available for program operating questions. Always include me in all emails between the alum and the group. •	Respect the alum's time: please email all - meaning all in the group - and avoid individual emails - so all benefit and repetition is avoided. •	Please be specific and brief in questions. Please consider this test-program a joint alumni-chapter Engineered Leadership (EL) activity - and offer your suggestions to improve the program. 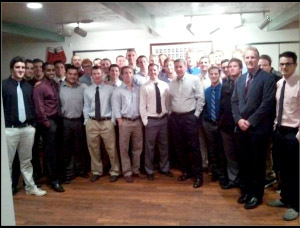 Ruby - thank you for your generous giving-back to our Chapter and men with your knowledge and time. Thank you for demonstrating we are a Brotherhood For Life. Reptar, Fobo, and Krusty - you have a unique opportunity to better prepare for job search and to grow as a young professional. 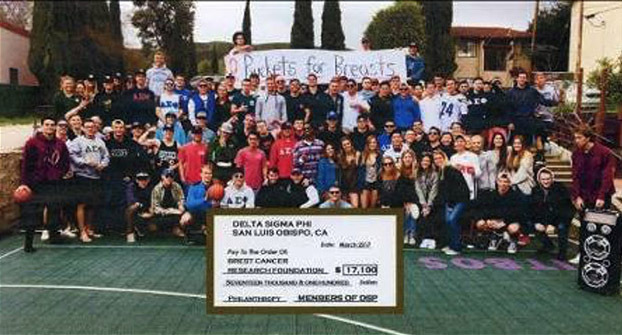 Please pay-this-forward in coming years as an alumni mentor to younger brothers who follow you at Delta Sigma Phi, the best lab-on-life at our "University in San Luis Obispo"! This is a launch. Please proceed. We are creating a new culture through a process that causes our men to reflect on how their collective decisions, and individual conduct, align with the value-set they created to guide them. Through joint discussions between our Chapter members and ACB, our Chapter debated and chose a set of five core values to live-by in Chapter governance and personal conduct. The core values we chose are: Leadership; Brotherhood / Loyalty; Traditions / Rituals; Professionalism; and Pride / Honor. We are committed to our Chapter’s purpose, values, supportive behaviors, and rules because we helped design them. This model guides our personal and group decisions by helping us to compare potential behavior (before-the-fact), and actual behavior (after-the-fact). We compare behaviors to value-driven standards of conduct we have committed ourselves to follow. Comparing potential behavior to our desired standards can be a preventative measure, while comparing actual conduct to desired standards helps us with corrective measures. Every successful business has come to recognize that they don’t perform their best without what is called “KPI’s”. These are the Key Performance Indicators (measurements) for the business. KPI’s stretch organizations to achieve at their highest potential. our alumni installed “Leading By Values” at the Chapter to make it clear about how we behave together to achieve our mission of excellence. To our knowledge, we became the first Chapter to implement KPI’s last year. Using these measurement indicators, we score ourselves on a weekly basis to track our attainment of Chapter goals. our Alumni purchased a large (4-foot by 8-foot) dry erase board so we may record our organizational performance. We update our KPIs at weekly meetings of all members in which we discuss and reach a group consensus of the level of goal attainments. Where we have fallen short in our progress, new commitments are made to achieve/exceed the goals. We offer the City and our fellow residents a respectful and law-abiding Chapter house and membership. We requested, and on July 29, 2017, received by surface mail, the following letter from the San Luis Obispo Police Department. Since the issue of 2014, we have not received a single violation or ticket. Such results do not happen by accident. We practice being a respectful and good neighbor. On September 23, 2015, a few days into Fall Quarter, the University sent the Chapter a warning letter about the use of a recruitment card on campus. As the following document shows, this was an individual member's action and was not authorized by the Chapter. I wanted to reach out to my ACB, Alumni Association, and National Fraternity for guidance on the matter of recruitment. Today I received a letter from the associate director of Leadership & Service for the university, Jason Mockford (attached below). 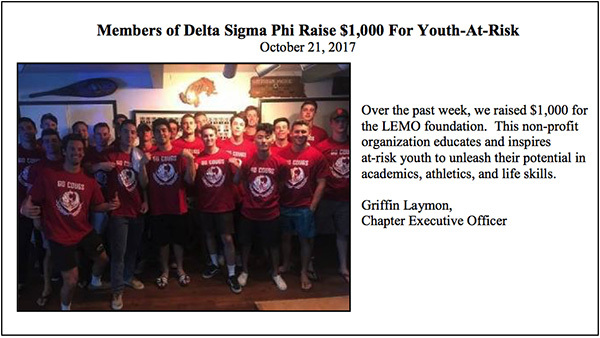 Mr. Mockford's letter states that we are in "violation of the terms of sanctions outlined in the letter from Vice President Humphrey" and that they "have received complaints that Delta Sigma Phi is actively recruiting". To my knowledge we have NOT formally or actively recruited any potential new members since we all moved back last week. I wish to know the proper course in this matter. After a Chapter inquiry into this matter, the source of the card was determined and that individual was required to immediately stop distributing the card. The following month, on October 8, 2015, a photo of the card appeared in the University's Mustang Daily newspaper. 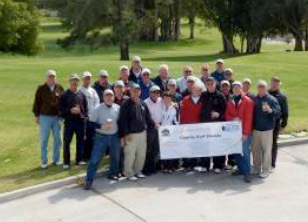 During Chapter disaffiliation, our alumni have continued, and expanded, the Delta Sigma Phi Charity Golf Tournament during the University's Open House. Chapter alumni have re-doubled their efforts during disaffiliation to inspire us to greater philanthropy. Leading-by-example, alumni have involved large numbers of us in the Charity Tournament which supports Aware, Awake, Alive - to benefit all University students. In the last two years, double-digit donations have resulted in a five-year contribution of over $50,000. "Teens and young adults often feel invincible. Hence, testing their limits with alcohol is part of their naive journey. Top this off with fear of punishment, and many choose to ignore a friend who might be in desperate need of medical attention. Aware Awake Alive gives teens and young adult the knowledge they need to know the signs and act quickly." On April 21st, Delta Sigma Phi will host their fourth annual Alumni Association Charity Golf Tournament in support of Aware Awake Alive. 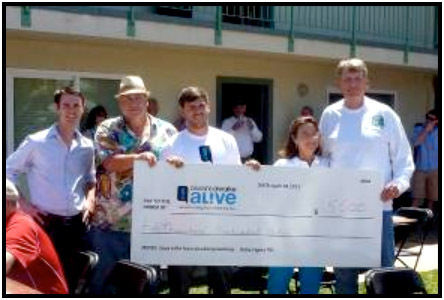 Scott and Julia Starkey founded Aware Awake Alive almost four years ago after their son, Carson, died following a fraternity hazing ritual at Cal Poly in 2008. What started as a small effort by the Starkey family to establish a legacy of giving in Carson's memory is now impacting high school and college students across the country. Our resources are being used on more than 100 high school and college campuses, including all 23 California State University campuses. Furthermore, Cal Poly continues to have one of the most robust Aware Awake Alive programs, and recent studies reveal that we are having a positive impact on student behaviors. 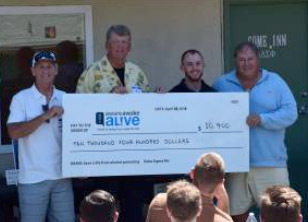 Aware Awake Alive is merging its resources with Cal Poly to expand the scope, outreach and impact of its life saving efforts. This exciting transition is currently underway as the organization is relocating to San Luis Obispo. This move will allow Cal Poly to position itself and our students as national leaders on bystander intervention. 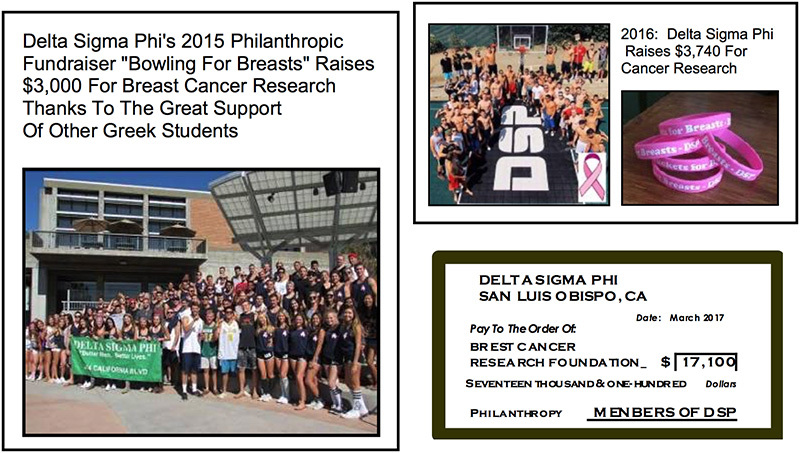 The local chapter of Delta Sigma Phi is working tirelessly to once again ensure a successful fundraiser. 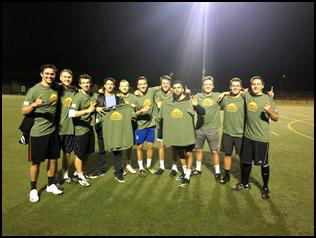 We hope you will consider partnering with Delta Sigma Phi and Cal Poly for this year's tournament. Donors at the $150 Silver, $400 Gold and $1000 Platinum levels will receive publicity on tee boxes and banners at the event as well as media coverage and recognition at the awards ceremony. Please contact Jim Larson at jwlarson2@holmail.com if you have any questions about this event. Thank you so much for your consideration of this request. Keith B. Humphrey, Ph. D.
We give scholarships to non-Greek men and women. This program operates during November and December to avoid conflicts with IFC Greek recruitment. Our alumni task us to help them judge the men's division - so that we can provide peer review and observe high character profiles. Last year the program give $1500 to men and $1500 to women. 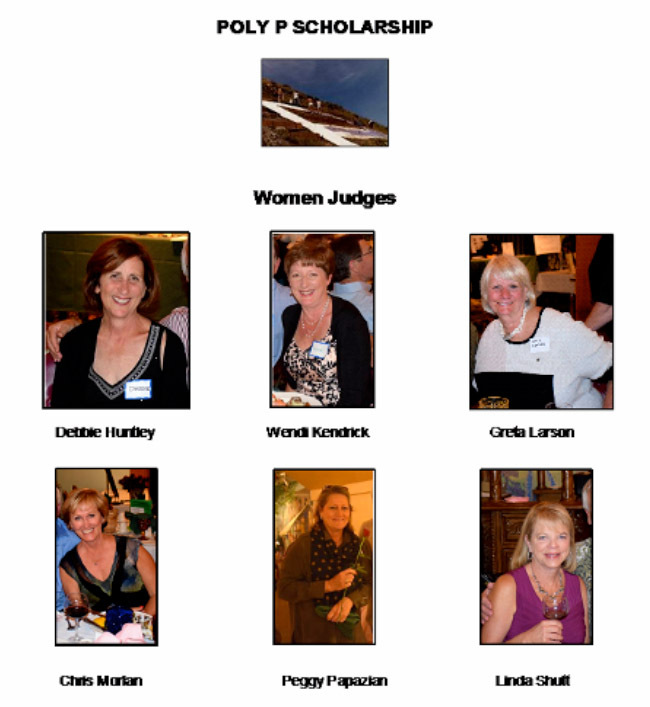 Most of the women judges for the woman's scholarship division are retired teachers. Men compete against men and women compete against women. 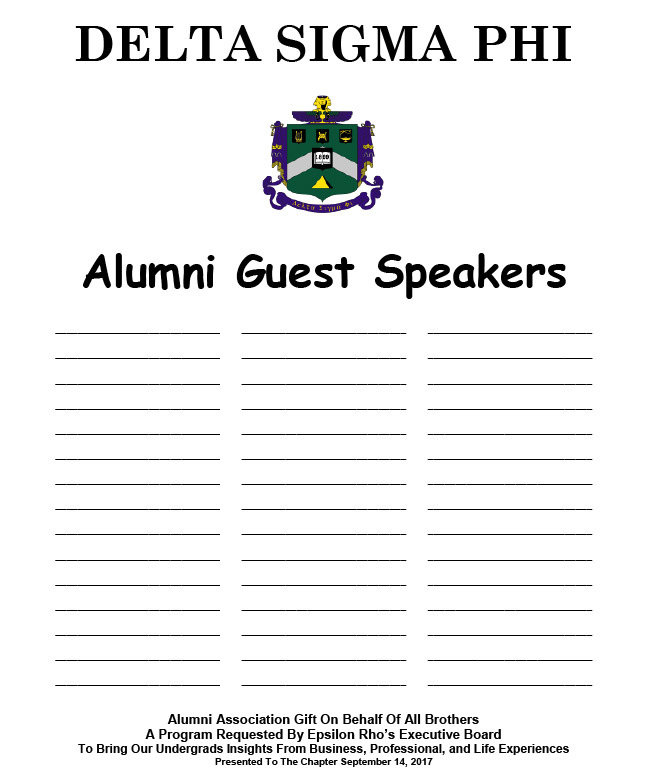 Would you agree to attend a Chapter dinner this coming school year, and speak to the men, as part of a new Alumni Speaker's Program"? They asked for alumni to bring their real-world industry and professional experiences to membership - to supplement their many lost program activities due to campus disaffiliation. It is sort of a Little-Brother program to "EL Speaker's". We already made the scroll, like the EL one, for alums to sign. It will be displayed." In response to our initial request, all alumni accepted, and generally with enthusiasm. All alumni will pay their own travel and lodging expenses. We thank them all. The Chapter's Alumni Association (Alumni Chapter) has voted funds tot support this new program. One of our local ACB officers is Board Vice-President Rick Rengel, AIA, owner of Rengel and Company, Architects. He also sits on the Lighthouse Keepers board, a not-for-profit organization founded in 1995 to renovate and maintain the 1890 facility that is now on the National Register Of Historic Places. Rick Rengel believes our members would greatly enjoy and benefit from volunteering for renovation and maintenance work at the site, and the lighthouse and community would benefit too. Our alumni have challenged us with the goal of increasing our current high number of members involved in University-recognized student clubs, activities, and government - to 100% member participation in the 2017-2018 academic year. To incent this new goal, the Alumni Association (Alumni Chapter) has voted funds to provide modest financial support for the campaign costs of members running for elected student government offices on campus or leadership positions in clubs. As a point-of-reference, the following lists our members involved in University-recognized organizations during 2016-2017, and their roles in these groups. 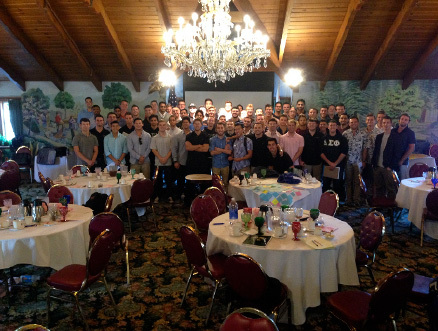 Our Chapter's men have a six-decade tradition of honoring the University and the community with service. A few significant examples follow. 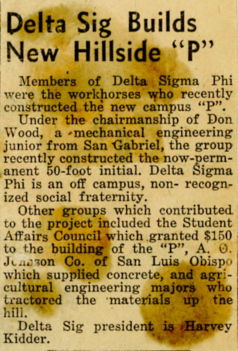 Our University students of Delta Sigma Phi Fraternity built the modern “Poly P" in 1957. The Fraternity’s engineering majors designed the “P” to be seen from campus, town, and from aircraft. Article courtesy of Telegram-Tribune. 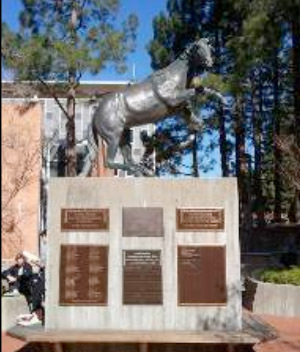 Bronze Mustang Sculpture – Delta Sigma Phi was the only fraternity to give to the University's bronze Mustang sculpture by the UU Building. 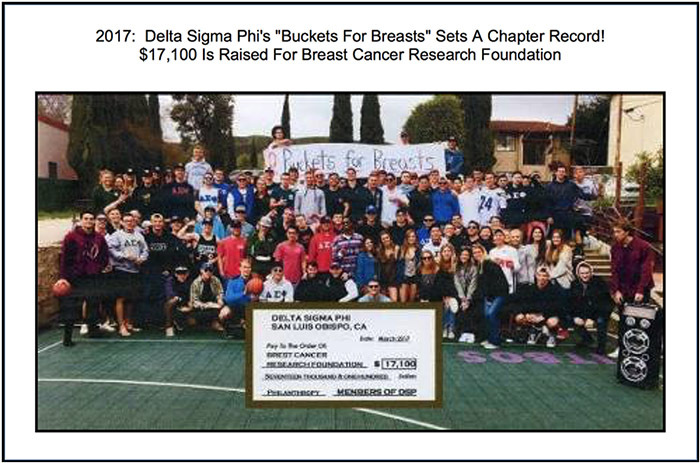 The amount was $1,000 – and it was given by our Chapter's undergraduate members - not by alumni.